People aren’t wasting any time trying to figure out how to monetize all those thousands of Facebook apps that have sprung up over the last couple of months. At least three advertising experiments have launched – the most promising, by far, is RockYou. The first out the door was FBExchange, a copycat of the LinkExchange idea from the nineties. It was created by the 30Boxes Calendar team – Narendra Rocherolle, Julie Davidson and Nick Wilder. Display others’ ads on your facebook application and build up credits, which can then be used to run your own ads on other apps. It’s a cheap and easy way to get exposure for your application, should the viral Facebook machine not create enough growth to keep you happy. See GigaOm for more. The company says they’ve booked $200k in revenue after just two weeks live. Lookery, founded by serial entrepreneur Scott Rafer, is a straight up advertising network targeted solely at Facebook applications. They say they’ll have access to deep demographic data on users and can therefore target ads to users with very specific characteristics – a woman between the ages of 20-25 in New York, for example. That theoretically will lead to much higher advertising rates. I like the idea, but Facebook itself has access to the same data and more and has had trouble selling high CPM ads at scale. Lookery needs big scale to be successful, and so will likely struggle in the early days. For now, Rafer says, they are passing 100% of revenue to content providers and will start to take a cut in a month or so when the economics support it. 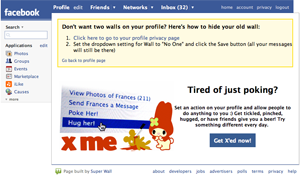 RockYou has been quietly testing their own idea of an advertising network – selling “users” to other applications. They’ve had a tremendous amount of success building viral applications on Facebook so far. 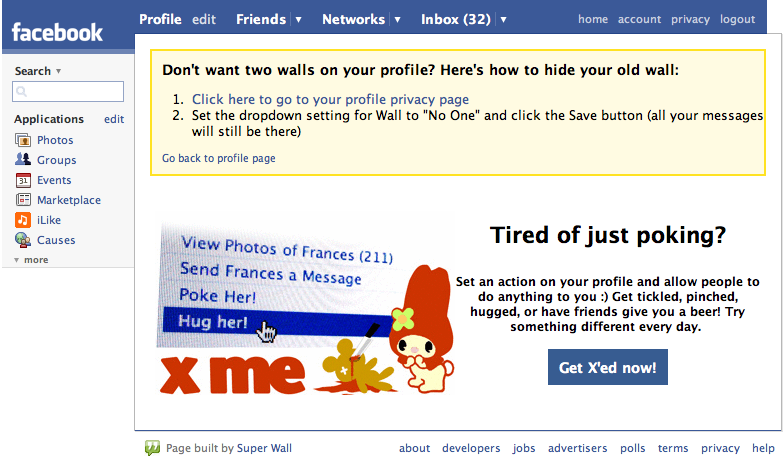 Their Super Wall app, for example, has nearly 3 million users and is adding hundreds of thousands of new users each day. It’s basically what it says – a better “wall” where friends can leave messages. With Super Wall, people can add pictures, video and other rich media. They’re offering to promote third party applications on Super Wall, and charging on a per-user-acquired (CPA) basis. When a user is signing up for Super Wall they are asked if they’d like to also add a additional application (the advertiser). See the screen shot to the right (click for large view). The test so far are going very well. CEO Lance Tokuda told me today that they moved $30k in inventory in just four hours. They are testing various price points, but the low end seems to be around $0.30 for each user they sell to another application, and they believe they can get as much as $1 over time. The effective CPM (or revenue per 1,000 pages) is a “multiple of $20” he says. This make them possibly the first Facebook application to have found a real way to monetize users and pageviews. Tokuda also says they have developed an API for Super Wall and will give free access to other applications to build their functionality into it. This can make your head spin a bit – Facebook is now widely considered a platform, and now Super Wall is a platform on top of a platform. It’s a good thing I guess that no one is slowing down long enough to really think too hard about how quickly the online world is evolving. Instead, they’re experimenting wildly. And some of this stuff is going to stick.